We are a church of the thirsty, of the broken, of the weak, gathered to drink from the true fountain of life. We struggle with fear, pride, guilt, sexual brokenness, fierce anger, addictions, and with the overwhelming stresses of life. For all who seek him, there is HOPE and PEACE in Jesus Christ. Welcome. 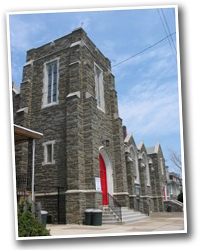 Wyoming Avenue Baptist Church has reorganized under Grace Church of Philly. We meet in the same location each Sunday at 10 am. Wyoming Ave. Baptist is a fellowship of God’s people who are seeking to make the hope of Jesus Christ known to the community of Feltonville. God has given us wonderful hope in His Son. This hope conquers all fear and triumphs over the horrible things in this world – injustice, oppression, poverty, loneliness, and even death.If you are longing for this hope, or if you are a Christian seeking to join with us as we serve God and reach out to our community, please visit us. We’d be glad to share with you the good news of Jesus, to help you make some sense out of life problems, and to help you fit into the body of Christ.